The Gloucester Landscaping website has been designed by the creative media team known as Quoakle. The website was created in 2016 using a WordPress responsive template called Enfold. This website replaces the original one created in 2012 using the Joomla software. During the last year the Quoakle team has been replacing all the sites originaly published using Joomla, and putting them onto the WordPress platform. The most important change for this website is that it is now fully responsive, so it works equally well on mobiles, tablets, laptops, and desktop computers. Quoakle first appeared as a word in Google searches in August 2006 based on a hamlet in Gloucestershire, “Oakle Street”. 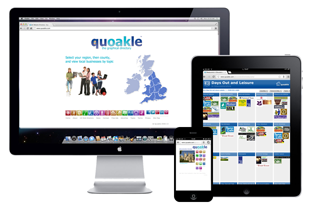 The brand was used to launch the online graphical directory – Quoakle.com. In the last few years, the Quoakle team has diversified into Website Design and Website Promotion, particularly supporting SMEs and Charities in the UK. Quoakle Director, Nigel Steele, always keeps getting new ideas and in 2013, the Quoakle team developed a series of topical directories – for Restaurants and also for Great Days Out UK. We have recently taken on some website promotion work with a new organisation for parents – Parent Power. Although our main focus is local, we are very pleased to work with clients as far away as you can get! … in Australia and New Zealand … Artificial Grass and Confident Communicating based near Sydney and YWAM New Zealand base near Tauranga. We don’t specialise in e-commerce websites but have recently finished a Shopify project for Working Dog Food. A Gloucester company that we’ve been working with for a number of years is Moxham Books the Gloucestershire based, small independent book supplier with many years’ experience supplying books for schools. The team of experienced staff will deal with all your book requirements including sourcing, verifying and checking availability, price and discount. Also, Quoakle has been privileged to help a number of charities and educational projects. Diamond Books is a Bible-based reading project which aims to publish Bible Stories for Children that lay foundations for children’s lives not only for their reading development but also for their understanding of God and his plans. The Diamond Books team are currently working on the Jesus series – 16 books for 4-5 year olds to read for themselves.